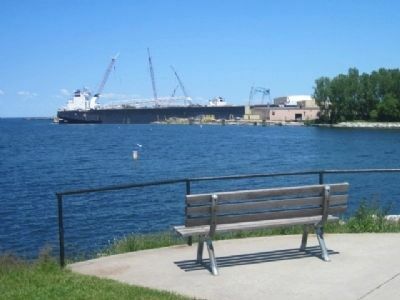 In pioneer times, private boats and commercial ferries were used to cross the waters of Sturgeon Bay. In 1887 the crossing became considerable [sic] easier when John D. Leathem and Thomas H. Smith completed a toll bridge consisting of a wooden plank road on a timber pile trestle and a center pivoting truss bridge to allow for boat passage. Tolls charged for crossing the bridge included "75¢ for threshing outfits," "25¢ for team and rider" and "5¢ per head for foot passengers." In 1891, the Ahnapee and Western (A & W) Railway received grants totalling $76,000 from the City and County to construct a line to Sturgeon Bay. A rail crossing was completed in 1894 by attaching tracks to the toll bridge and constructing a new western rail approach. In 1968 the rail line was abandoned, and the old truss bridge and remaining trestle, a serious hazard to navigation, were removed in 1973. 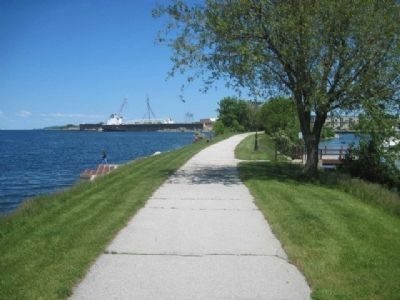 The earthen embankment lay dormant until 1987 when a grant from the Wisconsin Coastal Management Program enabled the city to improve the embankment for public enjoyment. 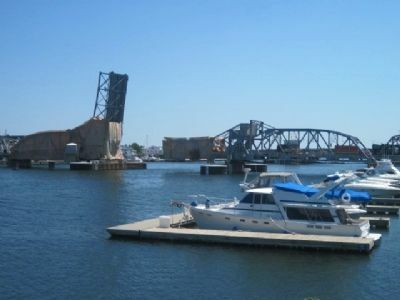 Erected 1987 by The City of Sturgeon Bay. Location. 44° 49.87′ N, 87° 23.043′ W. Marker is in Sturgeon Bay, Wisconsin, in Door County. Marker can be reached from N.Madison Ave.. Touch for map. Near Bayview Park. Marker is in this post office area: Sturgeon Bay WI 54235, United States of America. Touch for directions. Other nearby markers. At least 8 other markers are within walking distance of this marker. 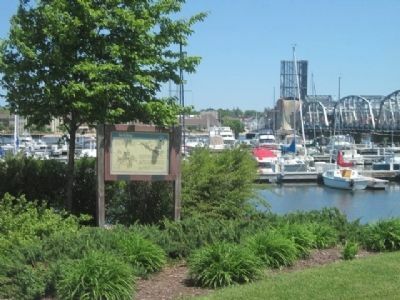 Sturgeon Bay Bridge (within shouting distance of this marker); Propeller and Stirrup Bearing (within shouting distance of this marker); Capstans (about 300 feet away, measured in a direct line); Dunlap Reef Light Tower (about 300 feet away); Steam Engine (about 300 feet away); Ship's Double Wheel (about 300 feet away); Fish Tug Linda E (about 400 feet away); Schooner Rudder (about 400 feet away). 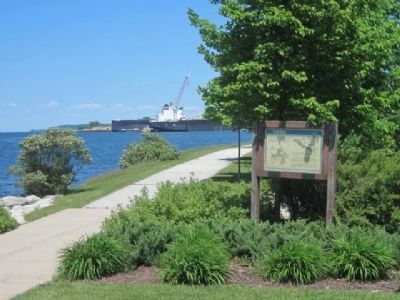 Touch for a list and map of all markers in Sturgeon Bay. More. 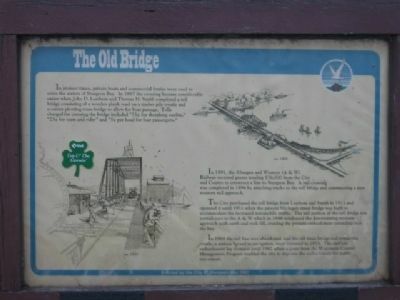 Search the internet for The Old Bridge. Credits. This page was last revised on June 16, 2016. This page originally submitted on June 13, 2011, by Bob (peach) Weber of Prescott Valley, Arizona. This page has been viewed 495 times since then and 7 times this year. Last updated on June 23, 2011, by Bob (peach) Weber of Prescott Valley, Arizona. Photos: 1, 2, 3, 4, 5, 6. submitted on June 13, 2011, by Bob (peach) Weber of Prescott Valley, Arizona. • Kevin W. was the editor who published this page.